A young artist practices her photography skills by taking a photo of a mural outside the Providence CityArts for Youth center. She is being mentored by PC students in the Community Lens course. Photo by Elizabeth Longo ’21. 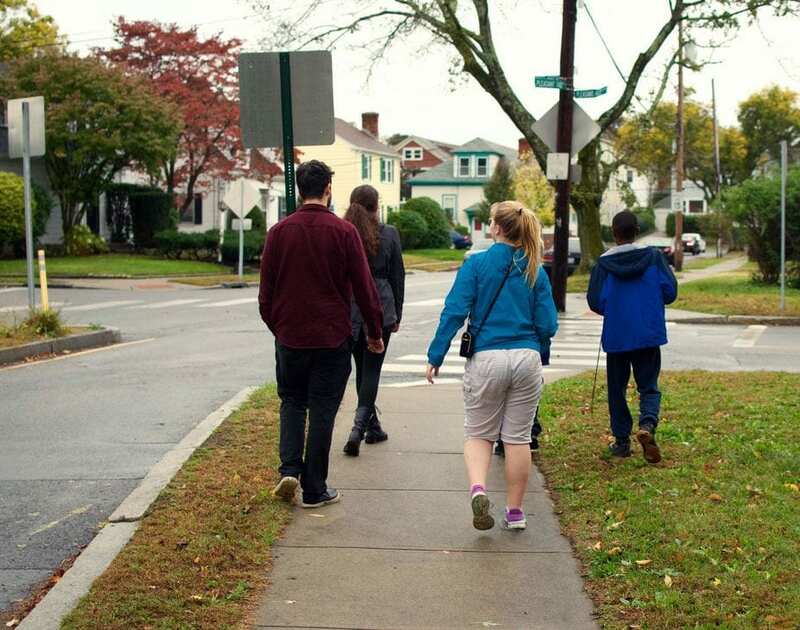 Community Lens, an interdisciplinary, team-taught course that links Providence College students and community youths, also provides a real-world connection between photography and social change. Offered by the departments of Art and Art History, Global Studies, and Public and Community Service Studies, Community Lens was introduced in 2011 to create those connections and to offer opportunities for community-based art, according to Dr. Nicholas V. Longo ’96, professor of global studies and of public and community service studies and PCSS department chair. “Our goal is for students to learn the skills of art and photography while learning about the nature of community through real-world community engagement,” said Longo, who is one of three instructors. The Community Lens course meets weekly on campus and splits into two groups for community engagement with approximately 16 Providence elementary and middle-school youths. Half the PC students meet with youths at the Mt. Pleasant Library for two hours on Wednesdays while the second group goes to CityArts for Youth for two hours on Fridays. Shannon Demers ’21, left, shows a CityArts youth how to take pictures of subjects. Photo by Elizabeth Longo ’21. Both community engagement classes were coordinated by PC alumni, allowing for a much stronger reciprocal relationship with these community partners. Kiley Leduc ’14, administrative coordinator at CityArts, who majored in global studies, is also an instructor in the course. Garrett Locke ’12, who was a public and community service studies major, is the youth services specialist at the Mt. Pleasant Library. He helped to recruit Providence youths for the photography class and provided an orientation for the PC students. While the PC students have weekly photography assignments related to course discussion topics and readings, they organize the projects and lesson plans for the community youths. 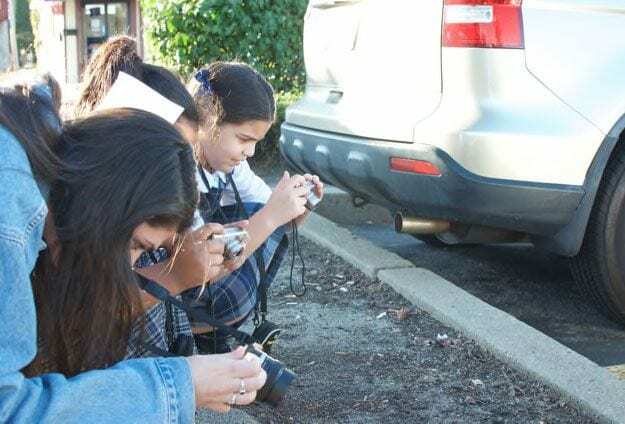 One week’s topic was “What is Community?” — when the young photographers took pictures of their neighborhoods — while another week’s theme was a scavenger hunt. The class evolves continuously based on the interests and ideas of the PC students and young artists. “The participants take ownership and make the class their own,” said Longo. According to Longo, there is significant value in engaging some of the younger population in the community. “First, our students serve as mentors and role models for the young artists,” he said. 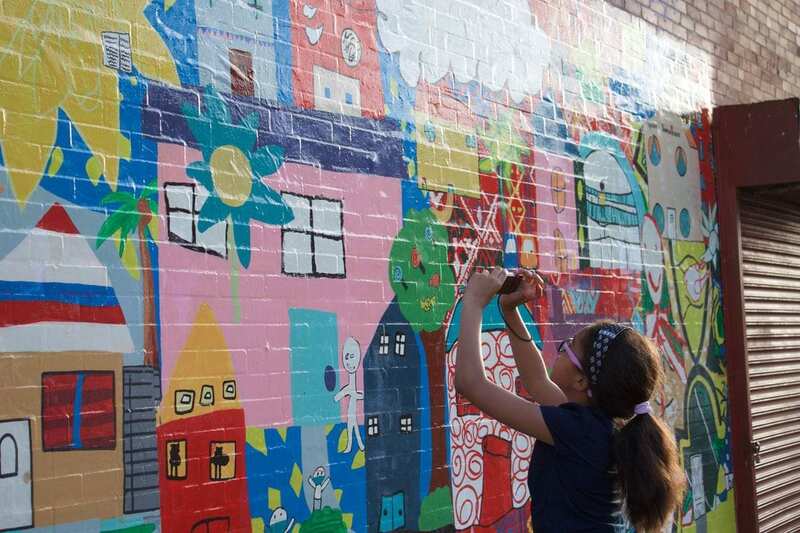 “At the same time, the young artists so often are teaching our students — about the neighborhoods of Providence, about how to see the world through the lens of children, and how to stay creative. And by teaching photography to young people, our students are becoming better photographers themselves. “As they are forced to develop lesson plans for each session and explain the concepts and techniques of photography to youths, it helps them better understand these ideas and practices,” said Longo. While learning about photography, both the PC students and the city youths are learning from each other in ways that will leave lasting impressions. Global studies major Kristen Lawler ’18 (Milton, Mass.) said she had heard about the course and was excited to enroll. Claire Rigaud ’19 (Holbrook, N.Y.), a mathematics major, has found community interaction empowering. Before enrolling in Community Lens, Payton Morse ’20 (Cape Neddick, Maine), a global studies major and photography minor, had never participated in a service-learning course involving children. Morse added that her peers and she are making a big difference in how the young students view art. “We have taught them to photograph with a purpose and a story in mind,” she said. “This simple lesson from a young boy has completely changed my perspective of the knowledge and capability of youth,” said Morse. The College-community partnership will culminate on Nov. 30 with the photo exhibition Nature of Community, to be held at CityArts at 891 Broad St., Providence. Open to the College community and the public, the exhibition will take place from 5:30 to 7:30 p.m. and will feature photos the youths have taken under the mentorship of the Community Lens students. The exhibition “is where we all celebrate our art, team accomplishment, and partnership. Seeing what our students, youths, and members of the community take away from the exhibition opening makes it far more rewarding,” added Sung.